The work of William Lawes is tantaliing. Born in 1602, he died prematurely - on 24 September 1645 - killed by a member of the Roundhead army near Chester during his service to Charles I and the Royalist cause during the Civil Wars. This provoked the saw, "Will Lawes was slain by such whose wills were laws". The loss to English music was huge. To hear but a few bars of his sublime music for viol is to wonder how he would have grown and how his enchanting harmonies, rich textures, original metres and inventive combinations of instrumental colour would have developed. 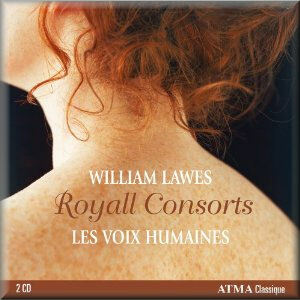 This excellent two-CD set from the Canadian company, Atma, presents all of Lawes' Royall Consort Setts played by specialists Les Voix Humaines. Probably best-appreciated during his life-time for his dance and dramatic works, including masques, his chamber consort music is perhaps the most profound, affecting, penetrating and forward-looking of everything that he wrote. Lawes was well-known as an expert player of the new 12-course theorbo, which was a low-tuned lute with extra bass strings. The Royall Consort Setts, however, are for two treble instruments (violins or treble viols), two bass viols and a continuo of two plucked stringed instruments. It's not hard to see with such a combination just how rich and emotionally strong the music was likely to be. Indeed it is; Les Voix Humaines are totally in accord with the idiom and they never rush. Listen to the Second Sett's, d minor, Pavan [CD.1 tr.5]… no rush, no hurry; yet no lingering either. They invite us to savour every bar, turn, phrase, segment where ideas either develop or go through transition. Lawes was among the first English composers to group his works into collections, suites - or "Setts" as he called them. Consisting typically of the dance movements with which we are now familiar - Aire, Alman, Galliard, Corant, Saraband - each Sett contains between two and five such. In itself this presents contrast and variety. The way that Susie Napper, Les Voix Humaines' director, has chosen to distribute the ten lovely works across two CDs adds to this freshness - particularly since all ten are written in only six keys, and six Setts in D.
The recordings, with differing personnel and made four years apart, could presumably have fragmented this presentation of Lawes' work. That hasn't happened. For sure, we notice changes in dynamic, tempo and subject matter. The Sixth Sett's, D Major Alman [CD.1 tr.9], for instance, is springy and contains folk influences, whereas the Corant which follows it is measured and almost French in delicacy and restraint. The performers are intent on conveying the integrity, the sense of wholeness and seriousness of purpose with which Lawes must have gone into the enterprise. That is to say, they make a performance, an 'event', or an 'occasion' out of this wonderfully melodic and inventive music - and bring it fully to life. The 'echo' movement of the same Sett [CD.1 tr.10] provides - with all its effects or repetition and self/cross-references - the opportunity for fey, specious mockery. Not for Les Voix Humaines. Theirs is a serious, respectful approach. Yet it skirts mere reverence in favour of doing the best by Lawes. They convey the depth and beauty of what Lawes could do. Comparisons have been made with the music of Monteverdi - especially his (groundbreaking Fourth) book of madrigals, where the writing in the top and bass voices is allowed to predominate over that of the inner ones. The Canadian ensemble works this very well, yet manages to adhere to a fullness and gentle emotional palette which lacks nothing nor is ever forced. Technically, the six players are impeccable from start to finish. We're not told of their instruments, although their website suggests that the principal gambists typically play a Barak Norman, London, 1703 and Bernard Prunier and Judith Kraft, Paris, 1982, after Colichon respectively. The players do not seem to feel it necessary to emphasise those aspects of Lawes' work which so eloquently presage those harmonic developments without which the music of Locke, Gibbons and even Purcell would surely not have been possible. These Royall Consorts, composed in the 1630s, were understandably Lawes' best known works during his lifetime. Les Voix Humaines play the music as music. Nothing more is implied. Finally, one of Les Voix Humaines' most significant achievements on these CDs is to have 'reconstructed' Lawes' music sufficiently successfully and with enough inner consistency, life and thrust for it not to sound like the reconstruction which such music from the era almost necessarily must. It's authentic and convincing in equal measure. Nothing spectacular, gaudy or forced. Everything suave, real and beautiful. The acoustic of the two CD set is warm, inviting and highly suitable to this gorgeous and wistful music, which is equally vibrant and lacks any sense of indulgence. Repeated listening is easy and is aided by the way in which the players' understanding has been projected. The booklet - with notes by Bruce Haynes - is a little on the short side; but it contains all the essentials. This is a release to treasure - especially since it's the only one in the current catalogue to gather all ten of the Royall Consort Setts as a unified collection.